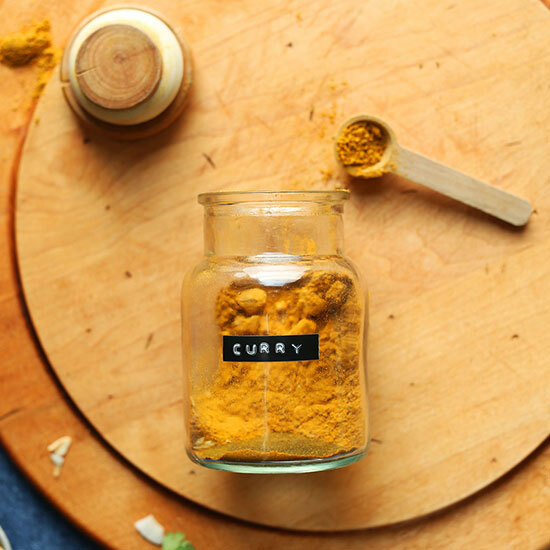 A quick and easy DIY curry powder to add to all of your favorite curry dishes, scrambles, sauces, and more! 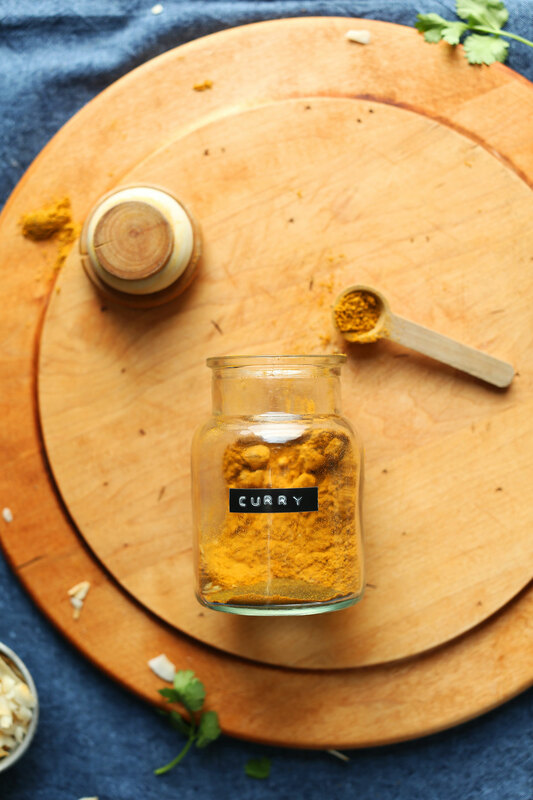 Easy, DIY curry spice that's perfect for soups, stews and hearty curry dishes. Links to recipe ideas below! Add all spices to a small jar and shake. Perfect for use in soups, stews, curries, and more! Stays fresh up to 3 months. *Recipe as written yields roughly 1/3 cup curry powder. This is the best make ahead curry powder I’ve ever tasted. Technically, curry means gravy or sauce. We call Indian flavored foods ‘curry’. So normally, when I prepare Indian recipes, I use whole and ground spices individually. I had a recipe that called for curry powder and whipped this up. It is so delicious! Love these labels! Did you make them/how? A label maker like this one! Great Blend! Made a seafood blend with sautéed onions, garlic, ginger. Can of coconut milk and 1/2 a lime. Put in 1/2 amt of cinnamon- not one of my favorite flavors with shellfish. Loved your curry so much more than store bought. Plan to mix and give as gifts! Will have to try this recipe! You are the food queen! Where those cute jar labels are from? I went to make green lentil dahl today and found I was out of store-bought curry powder but was able to make this as I had all the spices on hand… the dahl turned out AMAZING! Great mix!! Thanks so much for posting this recipe. I usually have to skip all recipes that call for curry powder because I despise the store bought versions. I tried this today, and it’s so good. Thanks for expanding my recipe box! We are glad you enjoyed it, Dami! Hi, is there any chance if you can add metrics used in Europe. Your recipes are fantastic but using it is so difficult as I’m not familiar with US metrics. Thanks in advance. Hi Teresa! We’ve introduced a new feature in which you can change between US customary and metric just above the ingredient list! Hope this helps! Recently, I have begun to blend my own seasonings. My search for curry powder led me to your site. I had already clicked on several others and written them down with a note to try. However, after discovering your blend, I tossed the others and will blend yours later today. I know by the ingredients it will be perfect. Thank you so much for sharing. Would you recommend using this curry powder recipe in your Curried Butternut Squash Soup recipe? This is a great recipe. I cut the cayenne in half for my mom, and used Garam Marsala to substitute for the cardamom I didn’t have. I found this recipe when it occurred to me that I didn’t have to use the boring pre-made stuff I had on hand, but I could find a recipe that was much more exciting. There is a richness that I’ve just never found in the store-bought blends and each spice’s flavor stands alone and together. I still keep some of the bland stuff on hand for other people in my house, but if I have the ingredients I make this. Consider omitting the cayenne pepper. By doing so, you can adjust the intensity of the curry flavor and the “heat” independently. e.g. You want a stronger curry flavor but you don’t want the dish to be hotter. It’s missing one vital ingredient… ground curry leaves! I️ just made curried deviled eggs with this recipe and they are delicious! This looks like a very balanced and all around great mix. For me, curry isn’t curry without a strong note of fenugreek AND LOTS of toasted black mustard seed. The latter can’t go in a powdered spice mix. black mustard seeds toasted in a bit of ghee or oil is beyond description. It’ll take your curry to heavenly heights. OMG!!! Just looked at your recipes!!! You SO totally have given me solutions and paradise!!! It’s late night here, but my mind is steaming through plans — and the people I know who will flip w joy when they get here! God Bless your giving hearts. Black mustard seeds and fresh curry leaves on top of many of my curries, essential on dahl. This is a good mix to have on hand. It will be in my bean burgers tonight. I’ve made curry spice in the past and personally I found this way too heavy on the cumin. It over powered everything. I adjusted by adding more of the other spices and added a bit of fenugreek and allspice which are common in curry spices. But if people love it as is that’s great. It was a good base to get me started. Thank you! I had all of the spices to make this….and then I compared it to the curry powder I had in my spice basket. Wow! No comparison, this is so vibrant. I’ll never use store bought curry powder again. This is a balanced, rich and yummy curry powder (used just a little less cumin as I’m sensitive to that spice). I’ve tried many DIY formulas and have purchased from upscale spice houses, as well as bulk. Nailed it! I just made Indian Curry Chicken using this recipe. Delicious. This will definitely be my go to curry from now on. Thank you for sharing. Where did you find your chicken curry recipe? I couldn’t find one online that I liked. Thanks in advance. Youtube has a lot of recipes to choose from. I must have made a boo boo when measuring everything. The mix is way too heavy on the cinnamon. What can I do to correct or counter balance the taste/flavor? I really don’t want to throw it all away. Hi Margaret! Your best bet is to add more of the other spices to balance it out and adjust to taste! Hope this helps! Try adding int to a tomato, garic, onion, sauce and stew pumkin in it. I find pumkin curry is yummier with more cinamon. Of course i cant garuntee it waill be good because i dont know how much cinamon you used. Sometimes chicken is good with more cinamon, you have to be a cinamon fan to apreciate it. I made this recipe with out thw mustard powder or black pepper because of alergies. It is still wonderfull. I love this curry blend! I usually would use a store bought curry powder that I found quite bland so this is amazing! Just made the butternut squash soup and it was so much better with this! Where do you buy your storage jars?? Hi! That one is from World Market! This is similar. Where do you get your cute little jars?? That one is from World Market! This is similar. This is awesome? Do you have any recipes to try this out with? Yes! Here, Here and here. I used 2tbsps with a chopped onion, 2 gloves garlic, 1/2 can coconut milk and 2 tbsps tomato paste….it made a lovely curry ? all of them) and vibration cooking style, added the most of what I like – turmeric and cinnamon. I also followed the order of how the ingredients are listed. I pureed most of it, and left a small amount in chunks. I made my own broth with whole black pepper, carrots, a mix of small potatoes, celery, onions, and garlic. The clincher is the fermented chili paste. When I turned off the heat I added chopped swiss chard to steam before serving. It is delicious! Thanks Dana! Now I can stop ordering curry soup from a local shop.